Mamas, if there’s one thing thats been worth some effort, it’s getting my kids to help with chores. There are plenty of chores for 5 year olds around our house, even though I didn’t start till recently. I’m guilty of not expecting enough of my kids because I’ve been a human vacuum for 5 years. At first it was because they were too little to help, then it was because I’m just faster at it, and now…well…they’re no longer toddlers and it’s important to me to teach them to help! It’s often slow, with mama bear in the room to direct. But right now I’m more about starting habits, and I think giving them chores helps them see mommy isn’t their servant. It also teaches them responsibility and follow through. Here are 15 ways 5 year olds can start helping at home without stealing their childhood. Don’t panic if your kids don’t do any chores yet, because you can start anytime. The best time to start is as soon as they are able. Kids need age appropriate chores for a few reasons. The whole reason why it’s hard for me to ask my kids to do some things is because I can do most things faster and how I want it. It’s almost more work at first to teach them because it can mean more spills and patience I don’t think I have some days. But I know it’s in their best interest to teach them responsibility even at age 5. In general, I’m in the same room as them when they are helping with “chores”, kind of overseeing it. So it’s not exactly a time saver yet, but I know if I teach them how to do it right, then eventually it will save me time. When it comes to 4 and 5 year olds doing chores, effort and a good attitude is important! They be sloppier, spill when clearing their plate, or sort clothes into the wrong bins. They’re just kids! If they are trying, that’s key because eventually they’ll get better. First put all the dress up in the bin. Great job! Now put the pillows on the couch. Great job! Next put any kid clothes in a pile. Awesome now run those to your room and put them in the right bins. Since kids often don’t feel like helping, I think it’s important to do it when I ask and not just if it seems fun. Because eventually chores won’t be fun! When a little kid discovers they can help with something for the first time, they are eager and excited. But at some point they will prefer not to. If I say, “Come unload the silverware please” I’m fine if he asks, “Can I finish this first?” but I’m not fine if he says, “After I finish this.” To me, there’s a difference. We love using Steve Green’s Hide Em In Your Heart DVD to teach our kids bible verses to music, and one of them goes, “Children obey your parents in the Lord, for this is right.” Ephesians 6:1. It’s a great way to get kids to start thinking about doing what is right. I highly encourage you to get the DVD if you want to teach your kids memory verses about sharing, helping, doing good to others, and about Jesus’s love. And, it’s a DVD so hello they will love it! (Beware of some impressive 90’s hairstyles and outfits though). This, of course, assumes a safe and loving parent child environment. I loved the advice that I received from pastor Mark Driscoll’s parenting series in proverbs, which is that kids can ask you “why” after they have done what you asked. I think this will set a good pattern for life and helps me know that I don’t have to explain my reasons to a 5 year old first. 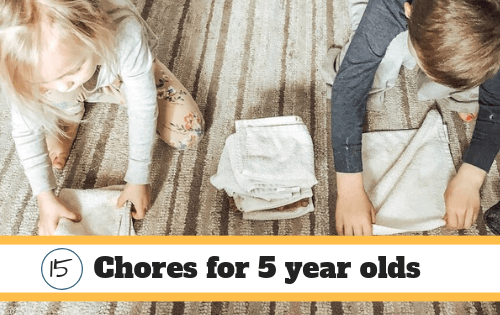 Ok, let’s get to the actual chores 5 year olds can do! The age is pretty flexible. My 3.5 year old daughter is capable of most the things my 5 year old son can do, but he would not have been that capable at her age. He was just way more clumsy, and had a harder time with directions and finding things. I’m basing this list off of what I ask him to do, but they both help with the exact same things. I was surprised one day when my 3 year old wanted to help, so I let her stand on a chair and she sorted them perfectly. She’s my detailed one. I immediately realized her older brother (then 4.5) could share those duties. Now they take turns. You’ve probably been doing this for a long time now. If not you are bending over about 50 extra times a day or more LOL! I keep a toy bin/coffee table in the living room and in their bedroom to make it easier. My 3 and 5 year old have been doing this for a year and a half since their brother was born. Sometimes I think I totally take advantage of their fast legs but they still seem to love helping! The clothes situation got better when I ditched folding most things like pants or pajamas and instead tossed them into 3 bins. One bin for each kid, and we put pants, socks, undies, and pajamas in those. Since my kids will often take everything out of their bins when getting dressed, a daily job has been for them to sort their clothes back into the right bins. I hang everything else and need to work on teaching them to put shirts on hangers. We only recently started this with silverware and cups. And sometimes I’ll set a pile of plates out and have them put them around. Our dinner table is pretty informal at this point and often the table never even gets set. I’ll just grab plates as I’m dishing up the kids from the stove and have them wait at the table. (I know, so not the old fashioned sit down all at once and pass food around). This just takes a reminding after breakfast, snacks, lunch, and dinner to put their cups and plates in the sink. If they can’t reach that but have steady enough hands they can set it on the counter. It’s a habit my son does without being asked now, wahoo! Prior to this, we had a shoe bin in the coat closet, which worked ok. However my kids cannot do coat hangers well yet or reach the bar so coats were always on the floor waiting for me to hang them up. This was a total shock when I walked into the kitchen one day and my 4.5 year old had just spread peanut butter on bread, found the jam, and made his own. My mind was blown because I’d never considered letting him try! Yes, I’m faster. But on days I don’t want to streamline 3 sandwiches I’ll let him make his own! Anyways, I have visions of a sweet teenage son carrying in ALL my groceries! 😉 Wow I just realized that’s only 8 years away. Please make time slow down! My daughter could get dressed, do zippers and buttons around age 2-3. My son was only coordinated enough closer to age 4! Anyways, this is pretty life changing to have 2 kids be able to put on a shirt and pants, and their own socks and shoes. I still catch myself dressing them when I am in the need for speed. But normally it’s their job. Since spills happen all the time, I keep the rag drawer low in the kitchen and ask the kids to help clean up spills. We never shame for spills but try to say, “Spills just happen”. We also just keep one at the table during meals which helps save time when a spill is pouring down onto the floor. We just started this (my son is newly 5 and daughter is 3.5). We had a couple teaching sessions on the living room floor about how to fold a wash cloth in half and then half again. To my amazement it was pretty easy for both of them! They kept saying, “Wow this is so fun!” And, “I wish we had some more!” I know that will wear off when it’s standing between them and Paw Patrol, but hey they can do it! Crafts are a huge part of the preschool age, but I was getting burnt on cleaning up afterwards. I about wanted to throw out our markers because of how much time I was spending every day putting 10-20 marker lids back on multiple times a day. I know I know, don’t tell me, it’s my fault for not making them do it. Now I do make them do it, and I only allow about 5-10 colors out at a time. And when they cut with kid scissors, I ask them to toss scraps from the floor to the garbage. They do a pretty good job, and then I do a final clean up. My 3.5 year old does this perfectly you guys! It’s so odd to me. And my 5 year old does a pretty good job, although last time he did keep peeling one until it was a limp and bendy thin carrot, haha! I’ve taught them how to hold it safely and how to always push away from their hands. Anytime I’m making a soup, I’ll let them do this (it’s a treat to them still). If you have any ingredients in the lower cabinets, pantry, or fridge your 5 year old can probably get them! A lot of times they want to help in the kitchen but I’m not always in the mood to have them do the scooping. Getting ingredients, pans, and measuring spoons is one way they can help. Take out garbage. 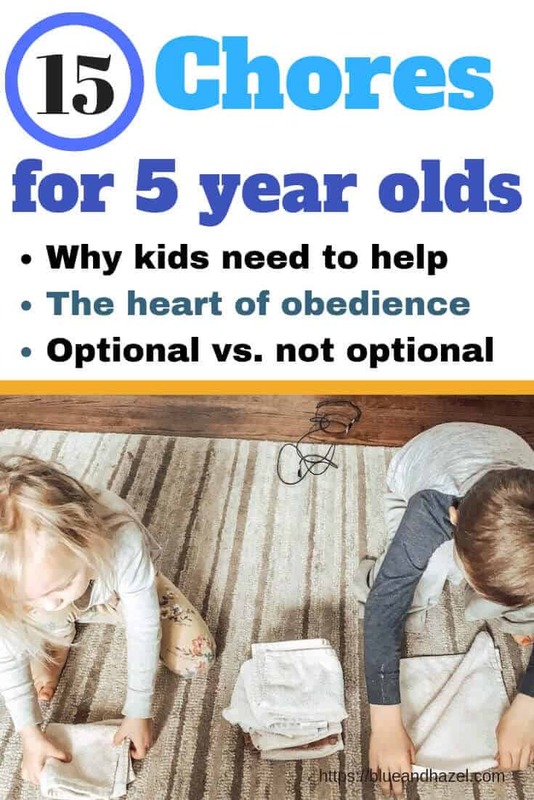 I can barely lift our heavy garbage bags down the stairs to the bin outside so I’m curious as to how other 5 year olds do this. However, we do have mini bins in the bathrooms they could start dumping into the big kitchen can. Clean any part of the bathroom. I use chemical cleaners and don’t want my kids around them so this is a no no for me for now. Also, they’re 5. They can experience the joy of cleaning bathrooms when they are way older, in my opinion. Sort clean clothes from dirty. I’m really picky about NOT washing more than I need to, because it can literally double or triple my laundry. So only I put clothes in the dirty clothes, or they can piece by piece if I have checked it first. Make their beds. Their beds consist of a crib mattress, pillow, and a large fuzzy microfiber blanket that they play with every day. Sometimes it’s a fort, or just a blanket for the couch. Either way, it’s not practical to have them make their beds with our set up. Dust. Haha, secret’s out now. I just don’t dust. I also don’t have any shelves at kid level and they would break our cheap plastic blinds if we dusted those. I remember dusting my mom’s special figurines she had on display from Germany. We have nothing like that here. We vacuum, that’s it. I get so overwhelmed hearing the phrase “mom I need” SO many times a day. Usually it’s a sign I need more sleep, some alone time, need to say “not now” more, or just teach them to do it! 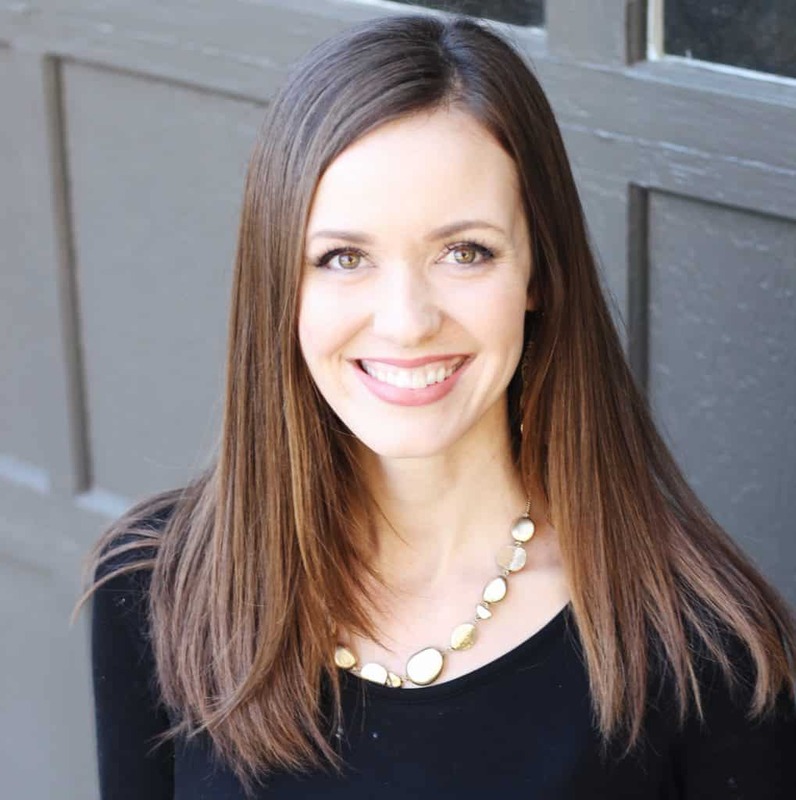 If you feel overwhelmed, read 8 things I’ve stopped doing to be a less busy mom. Can I have some milk? (We have taught him how to pour if it’s not a full gallon). Filling a cup of water from the bathroom sink. I leave a cup and stool there. Getting a spoon/fork from a drawer. Putting on their own clothes and shoes. Boots are a wonderful thing that even little kids can put on alone. Where to put coats and shoes when we get home. Hand washing. All the sticky hand requests are no longer your problem. Wipes are perfect for outings and they get them out of my backpack. Buckle up the car seat. Should you start a chore reward system? We don’t but may someday. Chores and “helping mom” is new enough that it’s still pretty exciting. And when it’s not so exciting, like picking up toys or carrying a grocery item from the car, they have to anyway. Other things are not as big of a deal to me (like if they don’t want to get ingredients out while I’m making banana bread). As the mom I’m still figuring out what to expect and if it’s something that matters to me. Are they obeying first time quickly? Are they starting to understand being in a family means helping? Do they act like mom will do it all if they don’t? I think eventually I’ll have a daily and weekly chore list for each kid. But right now, we are just transitioning from “mom is my slave” to “I have two hands that can pick up after myself”. LOL! How do you teach your kids to do chores? Do you have any systems in place? Are you nervous about starting any chores for the first time? Leave me a comment below and I’ll respond. Any ideas you share can also help other moms who are looking for ways to start chores.